In their own words “To hear the silence is to let the dogs bark about their past.” In between street folk, garage rock and smooth jazz, Puzzlehead is a freestyle band created by a group of various drifters and vagabonds from Quebec. They present you with something new, original and intimate and propose a particular experience that unveils their diverse backgrounds. Fabrice, Samuel, Mathieu and other artists that surround them are travellers and musicians that met by pure coincidence in the southern deserts of the Okanagan and fused musically to present their debut event in Oliver. 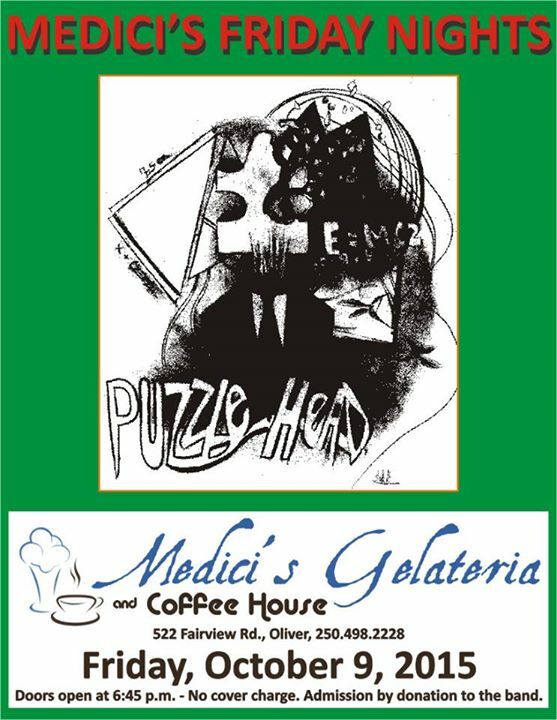 Friday October 9th at Medici’s Gelateria and Coffee House.at 522 Fairview Road in Oliver.250-498-2228. Host Marcel Morneau will present the band and open the evening for you. Doors open at 6:45 and the music begins at 7:30….Be here!! !